GainSaver is the place to shop for a great deal on a refurbished Early 2015 Macbook Air. The 11-inch Macbook Air is extremely popular with students and business executives who need a small and portable Mac laptop with a comfortable full size keyboard. The refurbished 11-inch Macbook Air is only 2.38 pounds. The tiny footprint of the Macbook Air is just 11.8 inches by 7.56 inches, which is just about the size of a sheet of paper! The Early 2015 Macbook Air is packed with advanced features like a fifth generation Intel processor, all-flash architecture, backlit keyboard, Multi-Touch trackpad and high speed Thunderbolt 2 port. And when you order from GainSaver, you also get a power adapter and 30 Day Money Back Guarantee. You cant go wrong with GainSaver! The Early 2015 refurbished Macbook Air is powered by the fifth generation Intel Dual Core i5 processor. While it still delivers the performance you need to run all your applications, the fifth generation Dual Core i5 processor is designed to use less battery power than before. That means you can do what you need to do for longer - without the need to recharge as often. The 11-inch pre-owned Macbook Air has a sharp, easy to read display with a resolution of 1366 x 768 pixels. With the Intel HD Graphics 6000 processor that comes built in, graphics and games are faster than ever. This is important when you connect your refurbished Macbook Air to an external display that can have up to 3840 by 2160 resolution. The 11-inch Macbook Air is the dream laptop for typists. It is light and easy to carry, and when you open up the tiny case, the Macbook Air reveals a full size keyboard thats extremely comfortable to use. The keys are responsive and provide just the right amount of feedback. In addition, the keyboard is backlit for use in any room light. When the ambient light changes, the Macbook Air keyboard automatically adjusts to the changing conditions so you always have the perfect lighting. The Early 2015 refurbished Macbook Air supports the blazing fast 802.11ac Wi-Fi standard. This gives you data transfer speeds of up to 1300Mbps  which is just about 3x faster than the previous 802.11n Wi-Fi data rate of 450Mbps. Youll notice the speed difference everywhere you connect to the internet. Web pages load and display faster and files download in less time  meaning youll be more productive with your refurbished Early 2015 Macbook Air! You Can Customize Your Macbook Air! GainSaver is the place to shop for refurbished Macs of all kinds, because we can custom configure your order with the specs you want. Gainsaver can install more memory and a higher capacity flash drive in your refurbished Macbook Air. If youll be away from your desk all day, youll appreciate a bigger flash drive that can hold all the files you need. 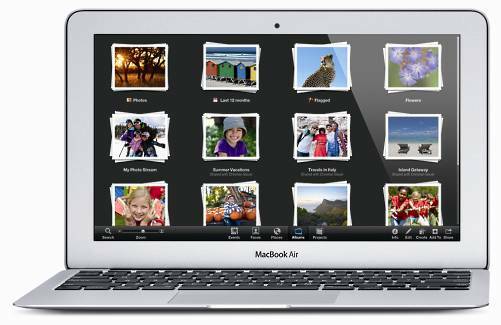 GainSaver can even convert your affordable refurbished Macbook Air into the perfect PC laptop! Just select the Windows option when you check out to have both the Mac OS and Windows operating system installed on your pre-owned Macbook Air. Its like getting two computers for the price of one!